Even if Infective endocarditis (IE) is relatively rare with an annual increasing incidence ranging from 10 to 15 per 100 000 person-years, it carries a high rate of morbidity and mortality . 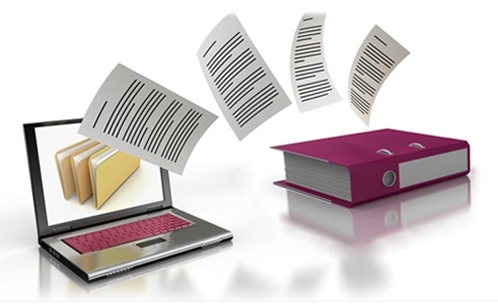 Medical treatment and targeted antibiotic therapy are the first line treatment and should begin as soon as possible. Usually isolated rightside heart IE (RSE) have better outcomes compared to left (LSE) or right and left sides infection (RLSE)  and even if the antibiotic therapy should be completed, in some cases, like huge vegetations or persistent infection with high fever or uncontrolled systemic compromission, early surgery is recommended to prevent life-threatening complications . Surgical treatment of IE has many controversies about repair or replacement the valves  and for RSE, also tricuspid valvectomy has been adopted in order to reduce recurrence of infection and a lower rate of postoperative complications . A 40-year old man with current drug addiction and hepatitis B and C, was admitted in to the emergency room of a peripheral hospital, presenting with acute fever, dyspnea. At hospital admission, the patient was confused, panting, feverish, tachycardic, and hypotensive. The respiratory murmur was bilateral diminished, absent in right pulmomary base due to pleural effusion. Laboratory analysis revealed leukocytosis with neutrophilia, severe anemia of unknown origin (5.5 g/dL), acute renal damage (serum creatinine 4.07 mg/dl), high PCT, metabolic acidosis with acidemia, hyperkalemia, and hyperlactatemia. The patient had multiple pulmonary condensations and right pleural effusion and was admitted to the intensive care unit for ARDS and multiple organ dysfunction treated with 12 red blood cells packages transfusion, NIV cycles and empiric antibiotic therapy (Levofloxacina, linezolid, Bactrim and Fluconazol). An episode of hemoptysis needed orotracheal intubation for 24 hours. During hospitalization, an echocardiogram was performed, which revealed a huge mobile vegetation (28x16 mm in diameter) in the tricuspid valve with a moderate regurgitation and another vegetation of 14mm on the left coronary leaflet of the aortic valve with severe eccentric jet regurgitation. Subsequently, methicillin-resistant Staphylococcus aureus (MRSA) was isolated from blood cultures. The instituted targeted antibiotic therapy let the patient progressed favorably with significantly reduction of inflammatory markers and PCT. After two negative blood coltures the patients was transferred to internal medicine ward and the antibiotic therapy was reduced after 3 weeks by means of linezolid (1200mg /24h ev) and Daptomicin (1000mg/ die ev). After 10 days, for recurrence of fever, Piperacillin/tazobactam (4.5gr every 6 hours ev) was added. After more ten days of antibiotic therapy the patients was so transferred to our hospital for surgical treatment, in stable clinical and hemodynamic conditions, but persistent fever. Coronary angiograms reveal no coronary artery disease and the preoperative echo confirmed the huge vegetations on tricuspid (Figure 1A) and aortic valves (Figure 1B) and severe eccentric aortic regurgitation jet (Figure 1C). 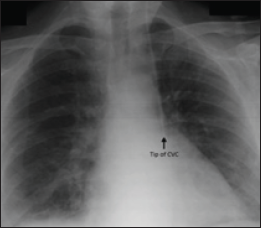 The Chest X Ray suggested a persistent left superior vena cava (Figure 2). 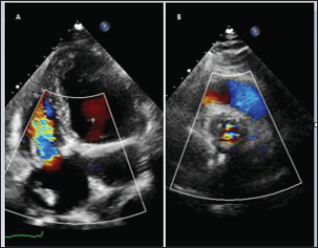 Figure 1: Preoperative Echo showing the huge vegetations on tricuspid (A) and aortic (B) valves and the eccentric aortic regurgitation jet (C). Figure 2: Preoperative chest X Ray showing a persistent left su-perior vena cava (PLSVC). Figure 3: Tricuspid aortic valve (AV) and the large perforation of the left coronary cusp (LCC). RC=right coronary. 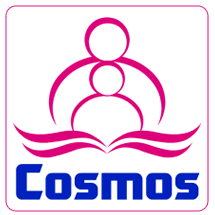 The operations was performed in a traditional way by a full median longitudinal sternotomy and institution of CPB by arterial cannulation of ascending aorta and bicaval venous cannulation (inferior vena cava and persistent left superior vena cava). Cardioplegic arrest was achieved by antegrade cold crystalloid cardioplegia directly infused directly into coronary ostium. The aorta was opened with a transverse aortotomy. 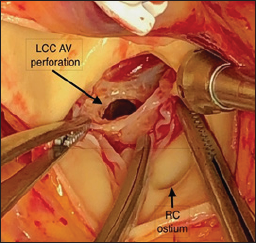 The intraoperative findings showed a tricuspid aortic valve with a large perforation of the left coronary leaflet of aortic valve (Figure 3) and a huge vegetation on tricuspid valve (Figure 4 AB). BioaorticTM prosthesis n° 23mm and a BioMitralTM prosthesis n° 27mm were chosen for the aortic and tricuspid valve replacement respectively using 12 and 10 double-needled interrupted 2.0 synthetic sutures using Teflon pledgets on sovra-anular position. Intraoperative transesophageal echocardiogram confirmed the well-functiong of both prostheses. The postoperative course was uneventful and the patient was dismissed in 7th postoperative day, afebrile, keeping only Oxacillin as antibiotic therapy. The discharge trans-thoracic echocardiogram confirmed the well positioning and functioning of both bio-prostheses in absence of paravalvular leak or significant pressure gradient (Figure 5 AB). Both native valve cultures showed no bacterial growth. 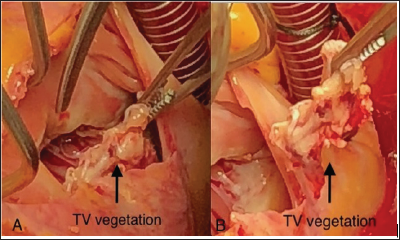 Figure 4: The huge vegetation on tricuspid valve (TV) before (A) and after (B) surgical removal. 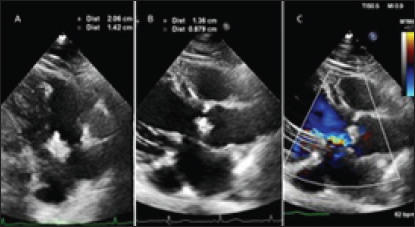 Figure 5: Discharge Echo showing well positioning and functioning of tricuspid (A) and aortic (B) bio-prostheses. Right-sided endocarditis represents 5-10% of total IE  but is more common in intravenous drug users or in presence of congenital heart defects (absence of right superior vena cava?) . S. aureus is the main infective agent in community IE and carries a high rate of morbidity and mortality . Isolated RSE usually has a low in-hospital mortality and a low rate of surgical treatment; on the contrary, the involvement of right and left side made the worst prognosis with a ten-year survival of 35% . The high risk of these patients is not only related to the high early operative mortality but also to a significant reinfection and reintervention rate especially in case of tricuspid valve replacement [2, 9]. To reduce the artificial material, in patients without high pulmonary pressure, a conservative approach by means of tricuspid valvectomy has been poroposed, with comparable long-term results . Recently a large metaanalysis on 1.165 patients founded a similar long-term survival between repair and replacement the tricuspid valve with a higher risk of recurrent EI in the latter . Unfortunately, in our case, a conservative surgery was not feasible for the huge vegetation of septal leaflet of TV and for a big perforation on AV leaflet. In case of replacement, a major question is still debated on the best prostheses. Our 40-year-old patient was an intravenous drug user with a very high risk of reinfection. The choice of the right prosthesis is a key factor in the surgical choice and there is an active debate about the supremacy of biological over mechanical prosthesis [2,12]. The BioMitralTM and the BioAorticTM bioprosthesis have shown a good resistance to reinfection  so, despite the young age, in consideration of the high recurrence risk we decided to implant these all pericardial prosthesis achieving good hemodynamic and clinic results. Even if the absence of bacterial growth on the native valve is a favorable outcome predictor , a longer follow up could be helpful to demonstrate the validity of our choice. Correa de Sa DD, Tleyjeh IM, Anavekar NS, Schultz JC, Thomas JM, et al. (2010) Epidemiological trends of infective endocarditis: a population- based study in Olmsted County, Minnesota. Mayo Clin Proc 85(5): 422426. Musci M, Siniawski H, Pasic M, Grauhan O, Weng Y, et al. (2007) Surgical treatment of right-sided active infective endocarditis with or withous involvement of the left heart: 20-year single center experience. Eur J Cardiothorac Surg 32(1): 118-125. Federspiel JJ, Stearns SC, Peppercorn AF, Chu VH, Fowler VG Jr (2012) Increasing US rates of endocarditis with Staphylococcus aureus: 19992008. Arch Intern Med 172(4): 363-365. Murray CJ, Vos T, Lozano R, Naghavi M, Flaxman AD, et al. (2012) Disability-adjusted life years (DALYs) for 291 diseases and injuries in 21 regions, 1990-2010: a systematic analysis for the Global Burden of Disease Study 2010. Lancet 380(9859): 2197-2223. Baddour LM, Chair W, Wilson WR, Bayer AS, Vance G Fowler, et al. (2015) Infective Endocarditis in Adults: Diagnosis, Antimicrobial Therapy, and Management of Complications A Scientific Statement for Healthcare Professionals from the American Heart Association Circulation. 132: 1435-1486. Mylonakis E, Calderwood SB (2001) Infective endocarditis in adults. N Engl J Med 345(18): 1318-1330. Moss R, Munt B (2003) Injection drug use and right sided endocarditis. Heart 89(5): 577-581. Nadji G, Remadi JP, Coviaux F, Mirode AA, Brahim A, et al. (2005) Comparison of clinical and morphological characteristics of Staphylococcus aureus endocarditis with endocarditis caused by other pathogens. Heart 91(7): 932-937. Vikram HR, Buenconsejo J, Hasbun R, Quagliarello VJ (2003) Impact of valve surgery on 6-month mortality in adults with complicated, leftsided native valve endocarditis: a propensity analysis. JAMA 290(24): 3207-3214. Protos AN, Trivedi JR, Whited WM, Rogers MP, Owolabi U, et al. (2018) Valvectomy versus replacement for the surgical treatment of tricuspid endocarditis. Ann Thorac Surg 106(3): 664-669. Yanagawa B, Elbatarny M, Verma S, Hill S, Mazine A, et al. (2018) Surgical management of tricuspid infective endocarditis: a systematic review and meta-analysis. Ann Thorac Surg 106(3): 708-714. Moon MR, Miller DC, Moore KA, Oyer PE, Mitchell RS, et al. (2001) Treatment of endocarditis with valve replacement: the question of tissue versus mechanical prosthesis. Ann ThoracSurg 71(4): 1164-1171. Musci M, Siniawski H, Pasic M, Weng Y, Loforte A, et al. (2008) Surgical therapy in patients with active infective endocarditis: seven-year single centre experience in a subgroup of 255 patients treated with the Shelhigh stentless bioprosthesis. Eur J Cardioth Surg 34(2): 410-417. Garci'a Granja PE, Lopez J, Vilacosta I, Sarria C, Ladron R, et al. (2018) Impact of valve culture in the prognosis of active left-sided infective endocarditis. Clin Infect Dis ciy p. 684.